ALIVE and Salish Sea Productions took the opportunity to interview each panelist at our Where Change Happens- Reconciliation in Action event that took place on June 20th, 2014. In these short vignettes, Mary Ellen Turpel-Lafond, Dr. Evan Adams and Wendy Grant-John offer insight into the development of sustainable, evidence-based approaches to fostering the health and well-being of the urban Aboriginal population. The Roles of Research Panel from Dima Alansari on Vimeo. 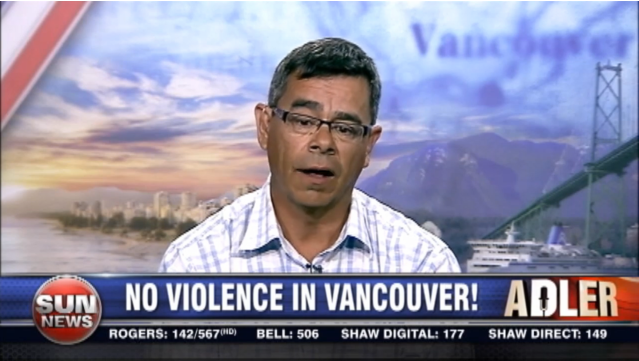 ALIVE executive director Scott Clark speaks with Charles Adler about ALIVE’s work and speaks out against anti-gentrification violence in the downtown eastside. previous ALIVE coverage on the anti-gentrification issue here. ALIVE stands with DTES residents, community groups and local businesses to end bullying, harassment and intimidation in the DTES. On Thursday July 11th at 10:00 AM in Pigeon Park, over 15 residents associations, community economic development non-profits, family and cultural service organizations, aboriginal organizations and various other non-profits from the DTES stood in solidarity to respond to the vandalism, intimidation, harassment and targeted pickets that have taken place lately. This is the statement that we have jointly released. A Joint Call for respectful community discourse, free from vandalism, intimidation and slander. ALIVE’s Executive Director Scott Clark spoke at the gathering, along with representatives from various community groups and residents. View video coverage from CBC news here. And a story from the National Post here. The event was also covered in the gastown gazette. Read story here. and a piece by Wes Regan, Executive Director of Hastings Crossing BIA here.